Ohio Wesleyan’s Grant Gossard (32) goes up for a shot in the Bishops’ 77-71 NCAC-opening win over Allegheny Saturday afternoon at Branch Rickey Arena. 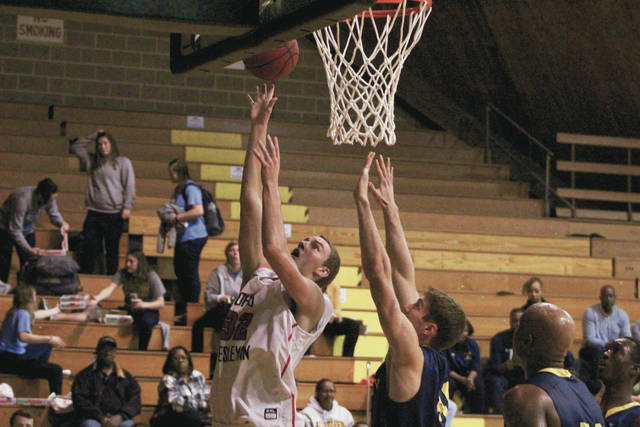 DELAWARE – There were times Saturday where it looked like the same old Ohio Wesleyan men’s basketball team. Then there were times it looked almost unrecognizable. Fortunately for the Battling Bishops, the former did just enough to outweigh the latter. Freshman Gabe Johnson knocked down a three-pointer and a pair of free throws in a 7-0 run that gave OWU the lead for good in a 77-71 win over Allegheny to open North Coast Athletic Conference play Saturday afternoon at Branch Rickey Arena. Johnson scored 14 of his team-high 18 points in the second half to lead OWU. OWU is in a youth-movement this season after losing six seniors to graduation, including Nate Axelrod, Seth Clark and Will Orr – all talented scorers who found a lot of success behind the three-point arc. This year’s group has to get its leadership from the six juniors on the roster. There are no seniors. “We’re a pretty tight group of guys already,” Johnson said. “We’re young – so there’s lots of room for improvement. We have a great group of juniors. Nate Axelrod and that group was so strong and they had great leadership on that team as well. So, the Bishops may struggle with consistency. Saturday was evidence of that. Freshmen Ethan Stanislawski and Nick Carlson sandwiched a pair of three-pointers around a Jaret Gerber layup in the Bishops’ 8-0 start in the first minute and 24 seconds. OWU had ballooned the lead to 27-11 just over 10 minutes into the game on the strength of four Stanislawski threes and two from Carlson. Stanislawski finished with 16 points, nine rebounds and four assists; Grant Gossard added 14 points and 11 rebounds for his third double-double of the season and Carlson had 11 points and seven boards for the Bishops (4-2, 1-0). Then the scoring slowed to a crawl. OWU managed just 18 points over the next 17 minutes or so as the Gators clawed their way back before tying it on a Lamar Todd three-point play. Todd gave the Gators a 47-45 lead on a layup on their next possession. It was the only time the Bishops found themselves down. Gossard tied it on the next possession to start the go-ahead rally. OWU scored in bunches, putting up 16 points over the next two and a half minutes to take an 11-point lead. Todd knocked down a pair of threes down the stretch and Brian Roberts Jr. and Billy Orso each hit one to keep Allegheny close. Todd finished with 18 points and 11 boards, Urso chipped in 11 points and Zach Ecker added 10 points for the Gators (4-2, 0-1). Next up, OWU continues conference play Wednesday night at 7 p.m. at home against Wabash.